In my last column, I had a look at some of the Cape’s best wines after Constantia. But did you know there was a wine regarded as (and I quote) ‘even better than the sweet Constantia that once gained world fame’? Trained at Austria’s Viticultural School at Klosterneuburg, Baron Carl von Babo was appointed as the Cape Colony’s viticulturist and inspector of grapevines in 1884. A chemistry professor from Halle, Germany, Paul Daniel Hahn passionately sought to improve viticulture in the Cape after his arrival in 1875. Having served on the Vine Diseases Commission of 1880, it was Hahn who urged the Cape government to acquire and develop Groot Constantia as a model wine farm in 1885, with Von Babo in charge, so if these two learned gentlemen rated a wine more highly than legendary Constantia, they can’t have done so lightly. ‘It was a wine of remarkably low alcoholic content: Dr Hahn’s analysis of various bottle shows slight differences, varying between 9.05 and 9.68 vol. per cent. This mystery semillon-based blend was fondly known as Oom Koos Mosterdpotjie Wyn, although it seems unlikely that this would have been the name used by its two most famous fans, Germany’s ‘iron chancellor’ Otto von Bismarck and short-lived emperor Frederick III (Queen Victoria’s son-in-law), who reigned for only 99 days before dying of laryngeal cancer on 15 June 1888. ‘With all the classical vintages of Europe at his beck and call, [Oom Koos Mosterdpotjie Wyn] was the only wine that the Emperor would touch during his last illness – still asking for his lips to be wetted with it when the final operation on his throat had left him no longer able to swallow,’ wrote C de Bosdari in Wines of the Cape. Apparently, this feedback was communicated ‘through the proper channels’ to Oom Koos Mosterdpotjie himself: Jacobus Francois Hugo (1816-1893), a farmer in the Worcester district, whose nickname (meaning ‘little mustard pot’) apparently reflected his very short stature. A descendant of the French Huguenot Daniel Hugot from Champagne (also on record as having been unusually short, and a blacksmith by trade), Oom Koos owned the Breedekloof farm then known as Bosjemansvallei/Boesmansvlei. According to Leipoldt, this was ‘a peculiarly favoured spot where the vines needed no irrigation whatever’ – and it seems Koos Hugo was ahead of his time, harvesting grapes in several passes, laying them out on stretched cowhides to cool down overnight (all rotten berries removed), and pressing them very early the following morning (between 3am and 7am). 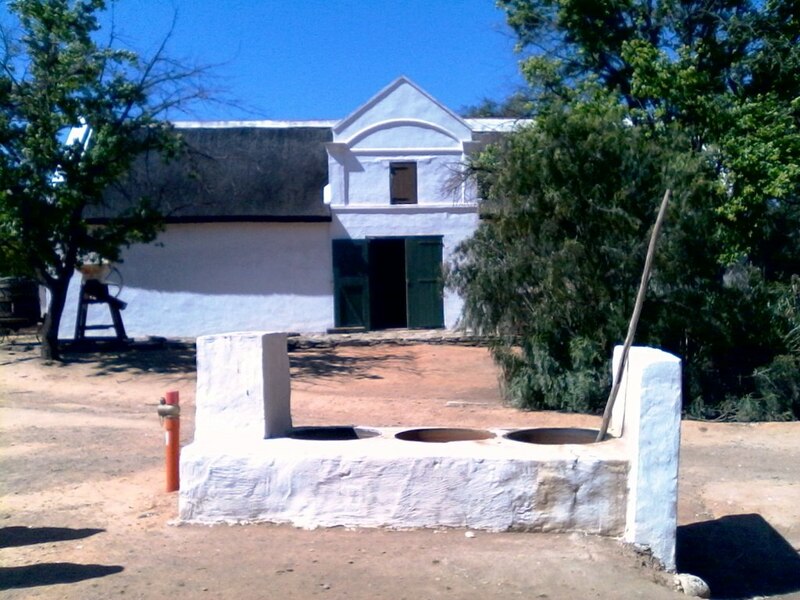 Koos Mosterdpotjie’s cellar at Wilgevlei. Image credit: Roché Petersen, Wikimedia Commons. Built in 1830, Oom Koos’s old cellar is apparently still standing on the farm now known as Wilgevlei, located on the R43 between Worcester and Wolseley, next to Botha Cellar, the giant co-operative to which it still supplies grapes. In fact, Wilgevlei is one of Botha Cellar’s five ‘priority farms’ from a biodiversity point of view, on account of its ‘pristine mountain fynbos, covered for the most part by the vulnerable Breede Shale Fynbos’. One of these ‘friends’ was Leipoldt’s uncle, Ewald Esselen, who travelled to Europe as secretary of the Boer delegation under Paul Kruger in 1884. After finalising the London Convention, which ended British suzerainty of the duly renamed South African Republic, the delegation toured mainland Europe, eventually meeting with Kaiser Wilhelm I of Germany (Frederick III’s father) and Bismarck. Turning 70 the following year, Bismarck was presented with a dozen bottles of Oom Koos Mosterdpotjie Wyn and – ‘not to be outdone in generosity’ – reciprocated with three bottles of 1846 Steinberger from historic Kloster Eberbach in the Rheingau. ‘The whole [123-gallon vintage] had been bought at the Eberbach sale in September 1858 by the King of Hanover for 6,000 florins or 120 pounds,’ wrote Leipoldt.